Advertising in India is forecast to increase by 13.0 per cent in 2017 and 12.2 per cent in 2018 to reach US$7.4 billion, says Dentsu Aegis Network’s ‘Ad Spend Forecasts, June 2017’. DAN’s prediction was based on data received from 59 markets across the USA, Asia-Pacific, Europe, Middle East and Africa. India is the fifth largest advertising market in the Asia Pacific region with a relatively small share of the region’s advertising spend at 3.4 per cent in 2017. The report points to a more cautious economic outlook in 2017 than the previous year, with global ad spend growth falling from 4.8 per cent to 3.8 per cent. The India forecast for 2017 has been revised down from 13.9 per cent in the September 2016 report, partly due to the announcement of ‘demonetisation’ programme in November 2016 by the central government, which led to some contraction in advertising spend. The report expects the demand for goods and services to pick up and to see a complete recovery in the first half of 2017. In the second half of 2017, one expects to see increased ad spending from categories such as mobile wallets, telecom 4G, banking and financial services. 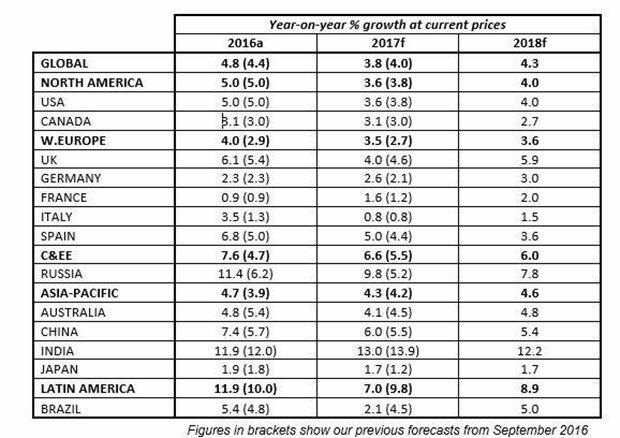 Globally, conditions are set to improve in 2018 with forecast growth in ad spend of 4.3 per cent. Events will play a key role in 2018. Events such as the Winter Olympics and Paralympics in South Korea, the FIFA World Cup in Russia and the US Congressional elections all expected to stimulate ad spend growth. “Another medium that is driving growth is that of ambient (at over 15 growth rates). Considering the changing retail environment, the medium, in tandem with digital, is becoming pivotal for delivering quality engagement with consumers,” Iyer added. Television in India continues to be the primary medium of advertising for many categories. TV advertising spend is forecast to increase by 12.0 per cent in 2017 and 13.0 per cent in 2018. In India, digital (at 16 per cent in 2017) is the third largest media type behind TV (35.2 per cent) and newspapers (32.5 per cent). The overall value of the digital ad spend market in India is relatively small at US$1.1 billion in 2017. In India, digital media is still primarily purchased directly (a predicted 86 per cent in 2017), though programmatic has started to make inroads. Mobile ad spend is forecast to reach 41 per cent share of total digital spend in India by 2017, with a 50.7 per cent year-on-year growth rate this year, and a forecast further to increase by 43.6 per cent in 2018. Driving mobile ad spend growth in India is 4G penetration as well as the increasing popularity of platforms such as YouTube, Facebook, Hotstar and Voot. Advertising expenditure in the Asia-Pacific region is forecast to exceed the global average, reaching 4.3 per cent in 2017 and 4.6 per cent in 2018. The value of the ad spend market will hit US$200.5 billion in 2018, a 34.1 per cent share of worldwide ad spend. Despite concerns about the economic impact of Britain’s decision to leave the European Union, UK’s ad spend growth held up better than expected in 2016 at 6.1 per cent. While there are signs of caution in 2017, with growth dipping to four per cent, 2018 is forecast to see growth bounce back to 5.9 per cent. A similar picture unfolds in the United States, where a slowdown to 3.6 per cent is forecast for 2017, followed by a slight improvement in 2018 to four per cent. The United States also remains the largest market in the world, accounting for 37.7 per cent of global advertising spend in 2017. Advertising spend in emerging markets continues to outpace developed economies. For example, ad spend growth in India is forecast to grow at 13 per cent in 2017, while China is the second largest market in the world by share of advertising spend – remaining the only emerging economy to feature in the top five largest ad markets. DAN forecasts show how digital technology continues to disrupt and drive innovation in the way brands connect with their consumers. In 2017, the report forecast that advertising spend on mobile will overtake desktop, reaching 56 per cent in terms of share of global digital advertising spend. In 2018, mobile ad spend will grow further to account for a total of US$116.1 billion. With smartphone subscriptions set to reach four billion by 2025 and about a third of consumers reporting that their smartphone is their primary source of entertainment, we can expect to see this trend continue to strengthen. Furthermore, the forecasts suggest that in 2018 digital will be the top media in terms of global share of spend, taking over television for the first time. Digital’s share of total media spend is predicted to reach a 37.6 per cent share in 2018 (up from 34.8 per cent in 2017), versus 35.9 per cent for television (down from 37.1 per cent in 2017), amounting to a total value of US$215.8 billion. Reflecting the continued disruption by digital technology of the print media industry, Paid Search (advertising within the sponsored listings of a search engine) is forecast to overtake traditional print media (newspapers and magazines) in 2018. Print media has been on a downward trajectory for some years now, but will likely fall to a 13.8 per cent share of total spend in 2018 (down from 15.1 per cent in 2017) while paid search is forecast to grow to 14.6 per cent, up from 13.6 per cent in 2017. While digital ad spend is growing rapidly and set to overtake television, within digital there are a number of new sources of growth that point to the future of advertising. For example, in 2017, online video is set to grow by 32.4 per cent; social by 28.9 per cent; and programmatic (i.e. automated ad buying) by 25.4 per cent. Looking ahead, brands will need to embrace the potential of disruptive technologies such as virtual reality, artificial intelligence and voice activation. However, research suggests that only 8 per cent of brands currently intend to use virtual reality for advertising purposes.